A veneer is a thin shell that’s custom-created to go over an existing tooth. Securely cemented into place, they function just like your normal teeth do. They’re resistant to stains and can be maintained just like a regular tooth with regular brushing and flossing. Once we’ve evaluated your teeth and determined that veneers are the most suitable option for achieving your goals, we’ll take impressions of your teeth and determine the appropriate color match. You can receive a set of temporary veneers to wear while yours are custom-created in our laboratory. 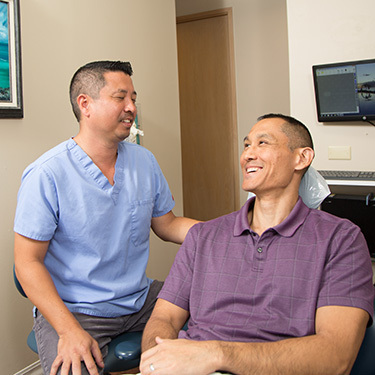 When your veneers are sent back to our office, you’ll return for a second appointment. The temporary veneers are removed, and the teeth prepared so that the permanent veneers can be put into place. A strong adhesive is used to apply the veneers, and they’re then light-cured to be permanently attached. Any excess material is cleaned away, and the veneer is then polished for a luminous finish. Because veneers represent a considerable investment, you will want to take good care of them. Doing so could extend their life to approximately 20 years. Daily brushing and flossing are essential; it’s also important to keep your twice-yearly checkups so we can inspect your veneers. To prevent breakage of your veneers, avoid chewing ice or tearing open packages with your teeth. If you’d like to get a photo-worthy smile with veneers, contact us today to schedule your appointment with our team! Your insurance coverage can be used for your visits. Care Credit payment plans are also available.